The thing is, what about this system or do not know or forget. But if the speed swim only on the neutral and pressing on the pedal the car goes fine, be sure to check the tank vent crankcase gases and its nozzles. A few words about the system. Recirculation of crankcase gases have devised a cunning environmentalists. It is designed for post-combustion of the vapors of the fuel-oil mixture from the crankcase of the engine by feeding it into the intake manifold. However, if the nozzles are torn, you will have the same effect, as if to acccess Shrove cover of the engine during its operation. 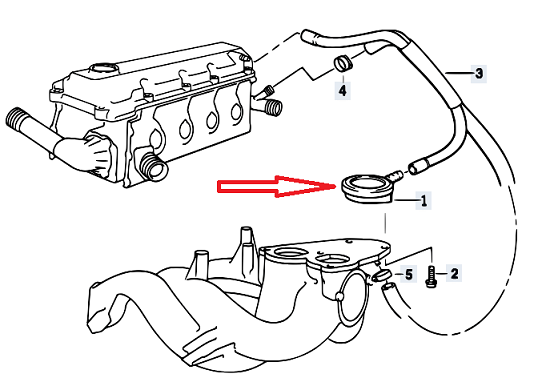 At the same time, if the valve fails, then idling in the intake manifold will be additional mix-glop from the crankcase, which was not taken into account by the meter. As a result of engine roughness. Changing it is very simple, is not too expensive (Chinese can be found openly cheap). If the swim speed in the neutral - it is better to start the diagnosis of the system than to open the meter and look for a jammed track.